This is a place dedicated to Image Makers. People who have contributed to an understanding and an awareness of Native American people, places and land through the images that they have created. Emmanuelle Crane uses her exceptional writing and photographic talents to help all of us learn from indigenous people from around the world. 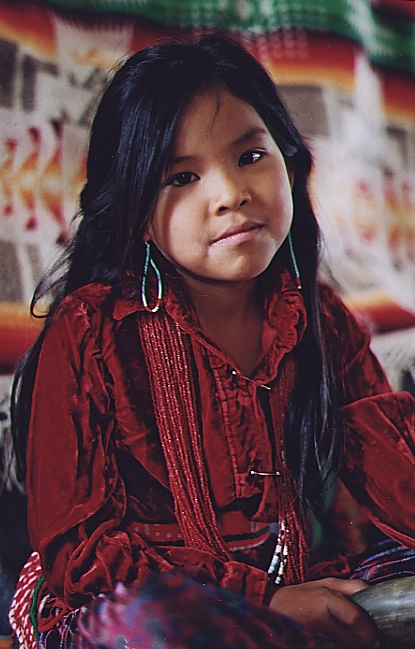 In her special Native American Images gallery, Emmanuelle shares some of the images and thoughts she gathered while living with the Blackrock family in the dry, hot Big Mountain area. 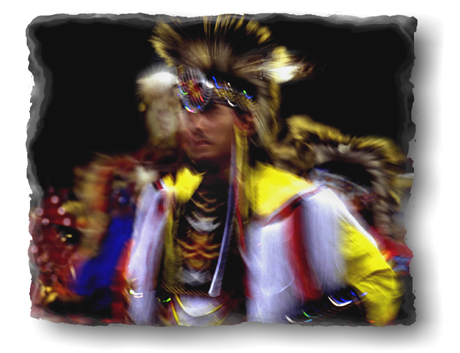 You certainly will want to enjoy Emmanuelle's Gallery during your visit to Native American Images. 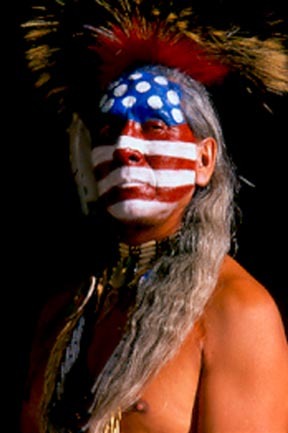 Thom as Wachal provide this image to Native American Images. It captures the beauty and harshness of Southwest Indian country, country on which the vibrant People survive even today. 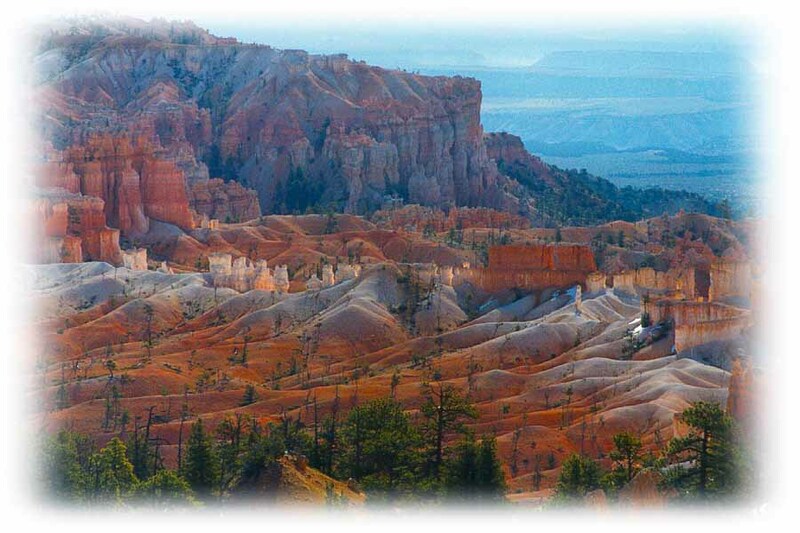 Tom has created images of the Southwest for nearly twenty years. Tom has graciously provided additional images to us. You can enjoy them by looking at Old Tom's special page. Michael Edward Zeller created this wonderful black and white image of Cliff Springwater, a man who heals the spirits and the souls in and around Shiprock. Cliff has labored hard to build a new mission, a place where people can come for renewed hope and a new day. Be sure you visit Mike's Gallery while you're here. Warre n Pearlstein has created an exceptional portfolio in his work with the American Indian Center (AIC) of Chicago. His work is part of a permanent AIC installation located in the "Our Lives" exhibit at the Smithsonian's National Museum of the American Indian (NMAI) in Washington, DC. Enjoy a sample of Warren's work right here. Gene Knitter, a high-powered stockbroker (retired), dusts up his rent-a-car and wears out his fancy shoes as he wanders the trails of the Southwest and the lands of ancient people. 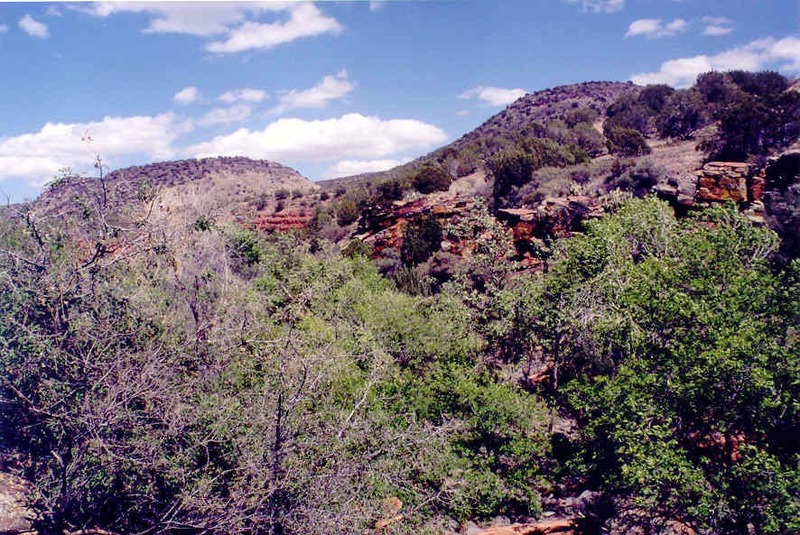 With a water bottle in one hand and his camera in the other, Gene contributes his images of the petroglyphs along Trail 93 of Lynx Lake, and off the interstate that breezes past Sedona, Arizona. Gene will tell you, "There is a hell of a difference between Wall Steet and Lynx Lake. 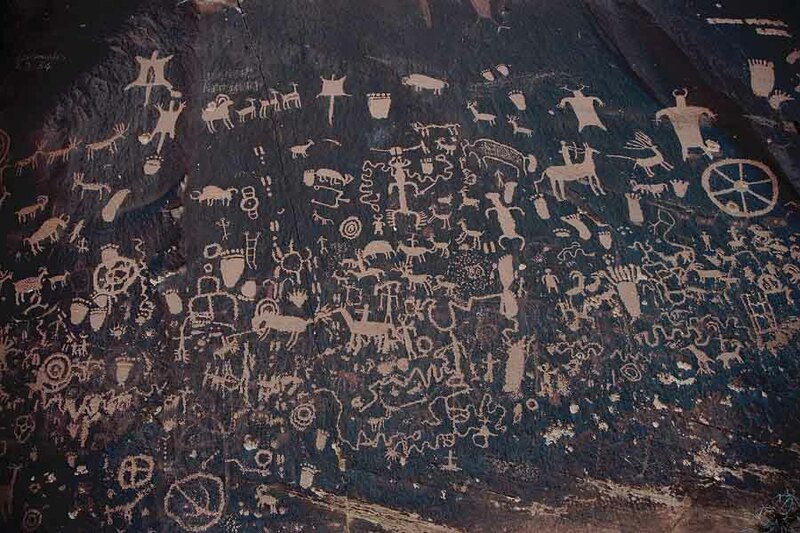 Just click here to see Gene's portfolio and a great deal more about the petroglyphs that abound in Indian Country. John Lloyd Godfrey was captivated by the N avajo and Pueblo cultures, and by the beauty of the land and the people who live there. We were happy to accompany Lloyd on his last visit to the Pueblos and to Canyon de Chelly, and we believe that you will enjoy the portfolio that Lloyd left for us. Be sure to visit Lloyd's Page. Don Doll, S.J. was introduced to both photography and to the Lakota people when he w as assigned to the Rosebud Reservation as a young Jesuit. His beautifully sensitive work and his understanding of Native America has been featured in many places, including National Geographic. Father Don Doll's photography for the book Vision Quest: Men, Women and Sacred Sites of the Sioux Nation is both powerful and inspirational. 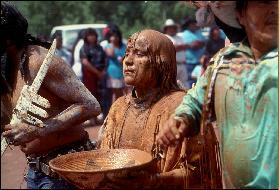 He was presented with the Crystal Eagle Award by Kodak for over twenty years of photography among Native Americans. Don Doll's website is as powerful as his images. 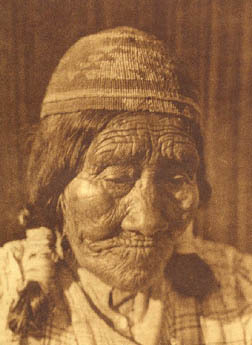 Sar ah Penman possesses a unique understanding of, and respect for, indigenous nations. She has lived among and chronicled the Lakota/Dakota/Nakota nation through writing, photography, video and radio documentaries. Sara says, "I hope that my work will contribute to an understanding of, and respect for, the lives and contributions of indigenous people." To learn more about Sarah Penman and her work you will want to visit her website. Marilyn "Angel" Wynn strives to portray her subjects natural tribal aura within their homeland or surrounding environ ment. She says, "I hope that my audiences will walk away with a new found compassion, understanding and acceptance of America's First People for their enriching contributions. The people who participate in Angel's efforts receive 50% of any sales of her images. You can see Angel's work on her website. Urshel Taylor started to paint about the age of 14 or 15. 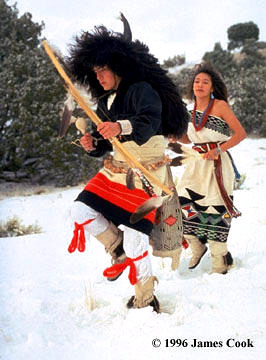 Urshel paints mostly Northern Traditional Dancers and other Native American images. "I also do a lot of sculpture in bronze or wood, but my first choice is painting. I always try to capture the dignity and majesty of what my people have been and what they continue to be today." 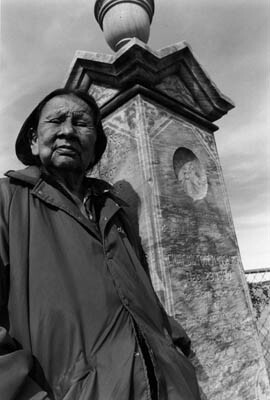 Urshel Taylor is of the Pima Tribe. 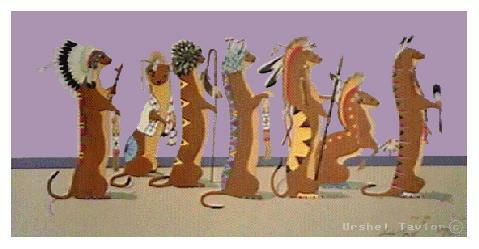 Visit Urshel Taylor's website to enjoy many more Native American images. Kent Tompkins is a very special Image Maker because he has created images of sacred sites and ceremonial events, by invitation, in the Navajo Nation. The landscape and the people demand his attention and respect. His work is without intrusion, his photography is organic and sensitive as you can see with this image of the final day of the Sunrise puberty "sing" of the White Mountain Apache. The Dine'tah Project is especially meaningful"
James Cook doesn't pretend to know everything abou t the many Native American cultures and customs, but he strives to learn, always respectful and with a desire to be respected. His photo project is ambitious, sensitive and wonderful as you can see by his image of the Tesuque Buffalo Dancers shown here. Share James Cook's amazing image project when you visit his site at Traditional Subjects. Richard Throssel was a Creek Indian who was adopted by the Crow Tribe around 1902. He has been described as "an Indian without a tribe." His images give an honest portrayal of the Crow people. Throssel stood for Native American rights, and became elected to the Montana State Legislature. The Native American Heritage Center at the U of Wyoming contains an excellent collection of Throssel's work. You can find even more by just going to your favorite search engine and searching for Richard Throssel. Edward S. Curtis (1862-1952) was the most prolific image maker of Native America. His complete portfolio consisted of over 2,200 photogravures and resulted in a 20 volume encyclopedia entitled "The North American Indian." Theodore Roosevelt wrote the foreword and the venture was underwritten by J.P. Morgan. The Curtis work is not always in favor because of his romanticized image of Native America. Yet his images command a solid price. You can view many of Curtis' photogravures at the Northwestern University Edward Curtis Library. A.C. Vroman (1856-1916) never received the fame or notoriety of Edward S. Curtis. Yet, of all the image makers , Vroman seems to be the only one to approach the Indian with all of the beautiful human qualities that are a part of the Native American people. His photography is as up close and personal with The People as they are rare and unknown. See our photo essay gallery about A.C. Vroman and his work. The Ancient People communicated through images placed on rock. Scholars call these images either petroglyphs or pictographs, depending on how the images were created. Ancient images are found throughout North America. We don't know who the Image Makers were. We just know that they were, and that they left indelible images that leave us to wonder. 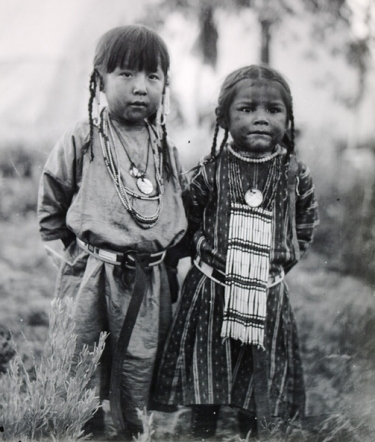 Native American Images gives you the opportunity to explore an ancient image site through Ancient Image Makers.